A close-up of the felt tip. My sister bought this eyeliner because she wanted to start trying out using eyeliner. But this was a disappointment to her and so she gave it to me. The liner itself is pretty easy to use, since it’s a felt tip liner. It’s something like a marker and you just draw it on. The tip is sharp enough for more detailed drawing and the pigmentation is pretty decent. The packaging is neat too – black and gold – and even it looks like a marker so you can easily slip it into your cosmetic pouch. However, it’s not waterproof at all and that’s where it loses out. On top of that, it is also not smudge proof. If you’re thinking of wearing this to somewhere where you’ll be perspiring, I’d advise you not to. This liner is a very basic, simple liner to use and it’s good for trying out at home to hone in on your eyeliner drawing skills. It can also serve as a Plan B liner when your Holy Grail one suddenly dries out on you. It’s not long wearing enough, though, and should only be used when you’re heading out for a short while, say, to get some groceries or so. 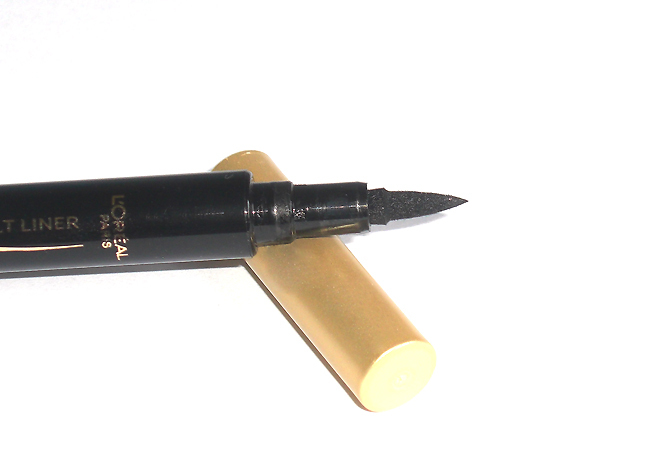 Review: L’Oreal’s Super Liner Instant Impact Felt Liner was last modified: October 6th, 2011 by Roxanne C.